A couple weeks ago I had the great fortune of staying at the Waldorf Astoria hotel in New York City with my family. The hotel is one of the most historic buildings in Manhattan and certainly one of the most glamorous hotels in the United States. It was the most luxurious place I've ever stayed. Guests here have included every president of the United States since 1931, English royalty and numerous celebrities. Cole Porter had a room here and was so enamoured of the place that he donated his hand-painted Steinway piano to the hotel. It still sits in the Peacock Lounge today. Below is a history of the hotel and some of my photographs. 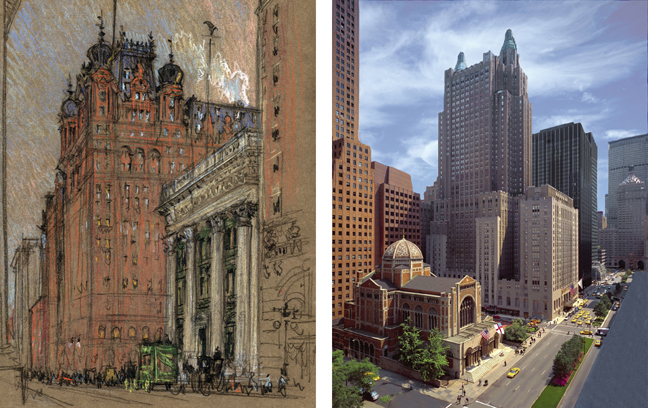 A sketch of the original Waldorf Hotel on Fifth Avenue as it appeared in the 1890s, on the left. The current hotel on Park Avenue is shown on the right. It remains one of the largest luxury hotels in Manhattan today. The Waldorf Astoria on Park Avenue was designed by architects Shultze and Weaver in 1931 but the legacy of the hotel dates back to the late 1800s when two feuding cousins, John Jacob-Astor IV and William Waldorf-Astor, two of New York's wealthiest gentelmen, attempted to out-do each other by building the country's most luxurious hotel. The Waldorf Hotel (built by William Waldorf-Astor in 1893) was 13 stories high, making it the tallest hotel in the world at the time. Not to be outdone, his jealous cousin, John Jacob Astor IV, built the Astor Hotel directly adjacent to the Waldorf, four stories higher in 1897. 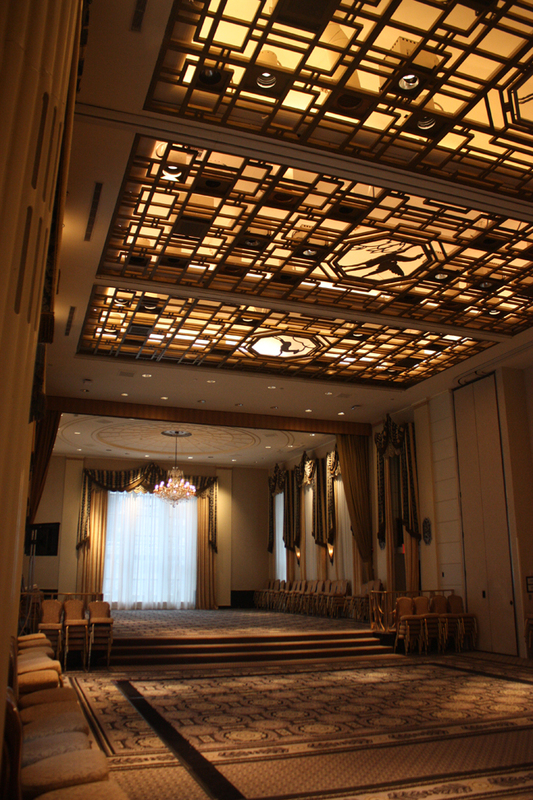 The hotels were eventually joined by a large corridor and re-Christened as one hotel, the Waldorf=Astoria. The original hotel was located on Fifth Avenue but in 1929 it was closed, after decades of hosting distinguished visitors from around the world. This paved the way for a reincarnation 15 blocks north on Park Avenue. The current hotel opened on October 1, 1931 as the world’s largest and tallest hotel, a veritable city-within-a-city. Today it remains one of the world’s largest Art Deco buildings and the Waldorf=Astoria continues to be one of the city’s most beloved – and utilized – institutions. Below are some photographs I took of the hotel. 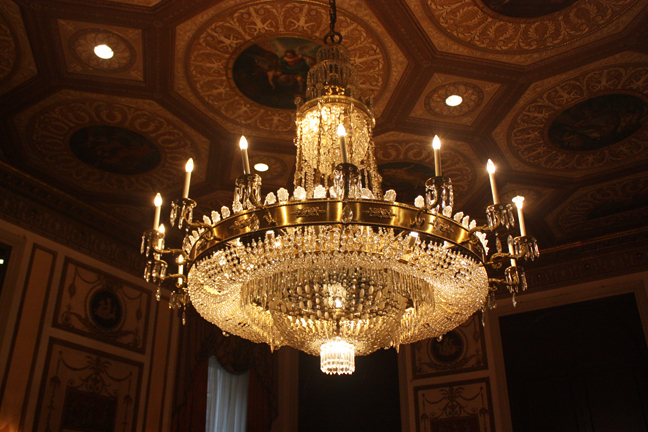 I was especially dazzled by the beautiful chandeliers, many of which are made with Waterford crystal. 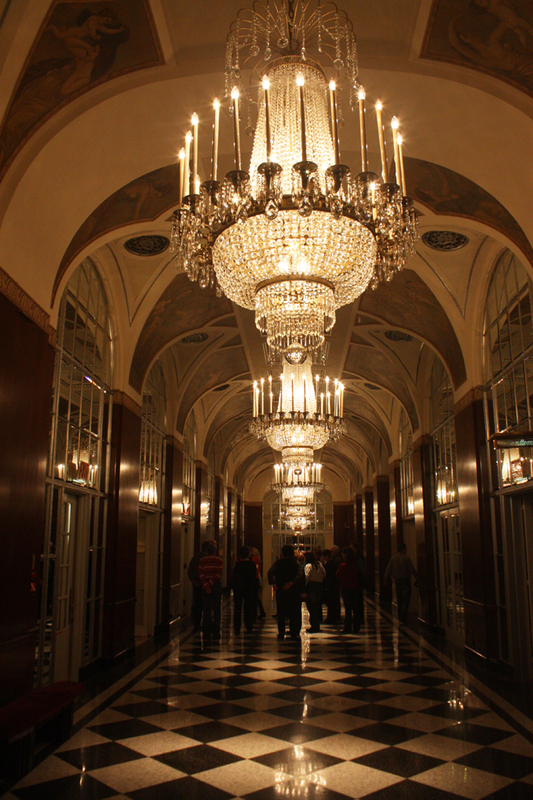 This is the main Park Avenue lobby of the Waldorf. It was recently redesigned to mimic its original state. This is how the room appeared when the hotel opened in 1931. 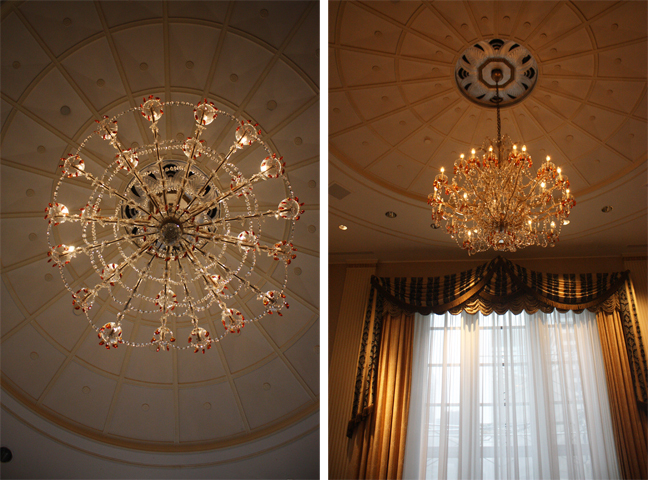 Part of the renovation included the removal of the enormous chandelier that once hung from the center of the ceiling. It was sold to a private buyer in New Jersey. You will notice the beautiful mosaic floor. The center circle depicts an image of the six stages of life (birth, childhood, adolecense, adulthood, old age and death) using over 145,000 small tiles. Another part of the renovation included removing the cocktail bar that used to be located on the left where the piano lounge now sits. On the right, the cocktail deck was removed to expose the windows over the main entrance. 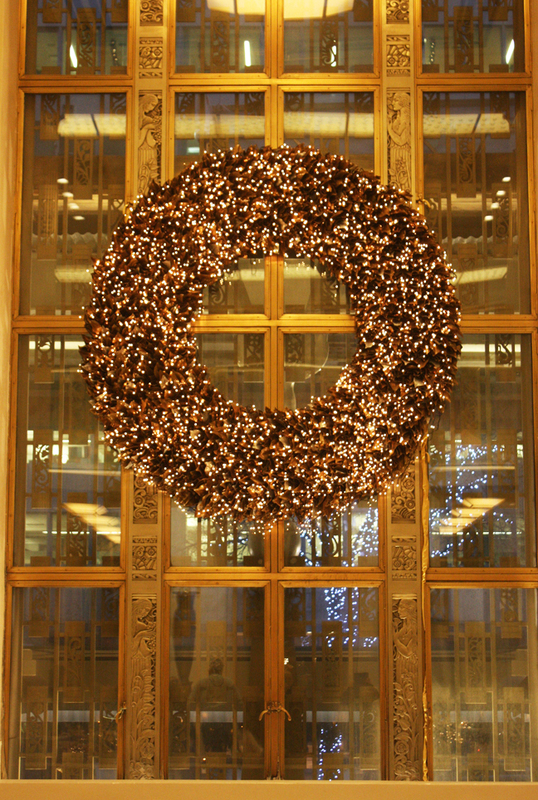 A massive wreath was hung over the main doors for the holidays. The corridor that linked the two original hotels on Fifth Avenue was recreated in the new Park Avenue location and named "Peacock Alley" after the high-society women who would parade between hotels preening themselves in their finery. The corridor joins the lobby of the Park Avenue hotel with the Waldorf Towers, a luxury residence. The clock shown above was a gift to the hotel from Queen Victoria. The Statue of Liberty pinacle was added later by the hotel's owners, much to the chagrin of the Brits. 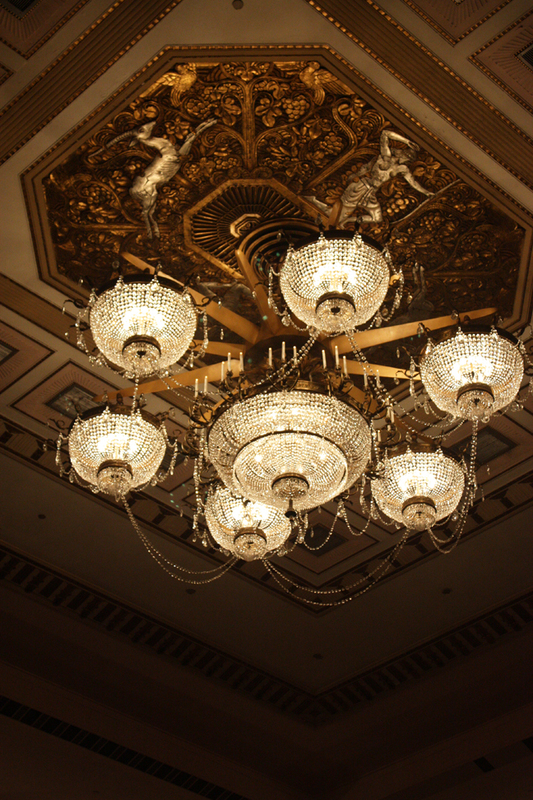 You will notice all of the beautiful Art Deco details on the ceiling and the massive marble columns. 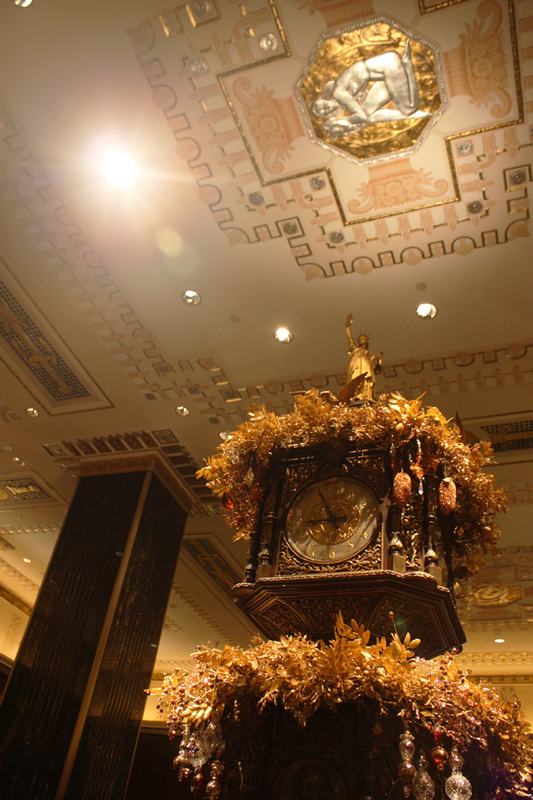 One must always look up at the Waldorf! 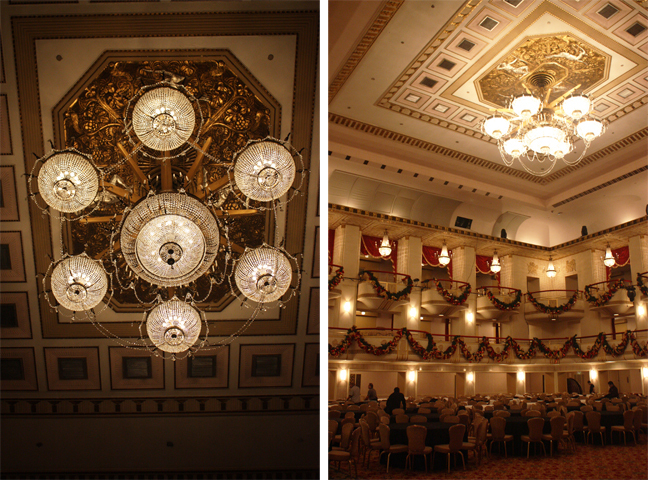 This incredible chandelier is located in the Grand Ballroom - a four-story room with the most beautiful details. 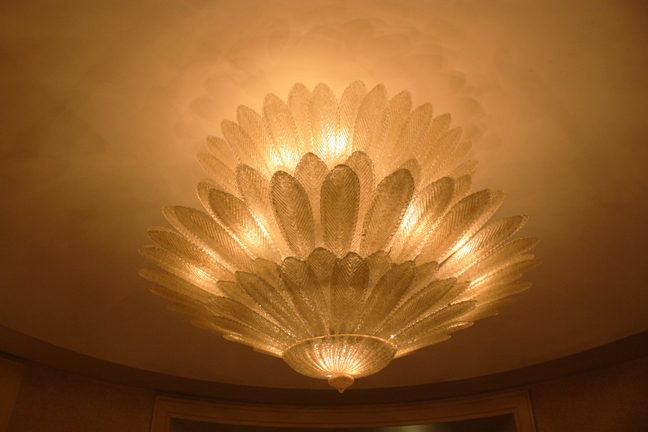 The crystal on this chandelier is Waterford. Again, notice the glorious Art Deco patterns on the ceiling. 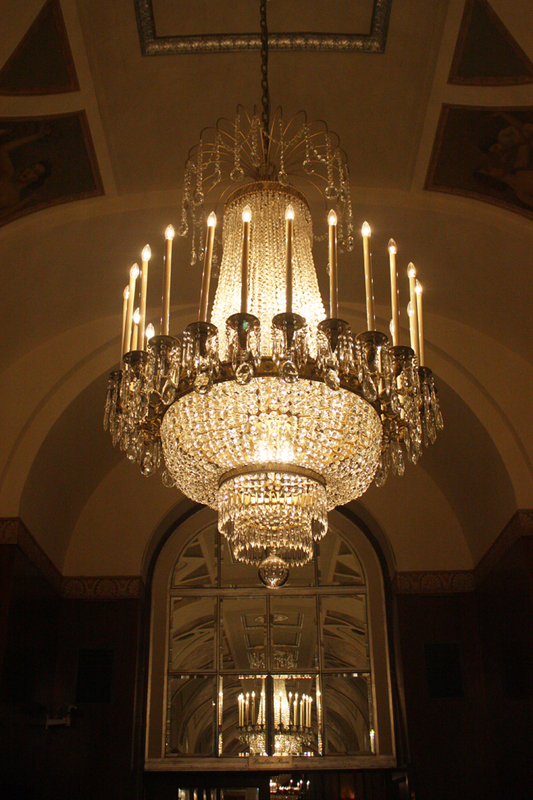 Another view of the chandelier and the massive ballroom, with its row of balconies. 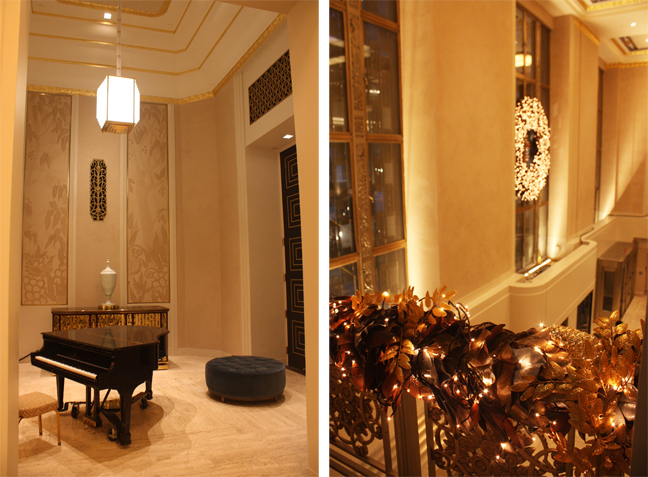 Even the corridors are decked with gold-plating and beautiful architectural details. This feather-motif chandelier was one of my favourites. It is hung outside the entrance to the Starlight Room, a large ballroom used for weddings and events. Beautiful Art Deco details inside the Starlight Room abound, including the large wooden 'screen' that covers the lighting on the ceiling. The lighting can change colours from warm pinks to cool blues, reflecting the tones of a setting sun. 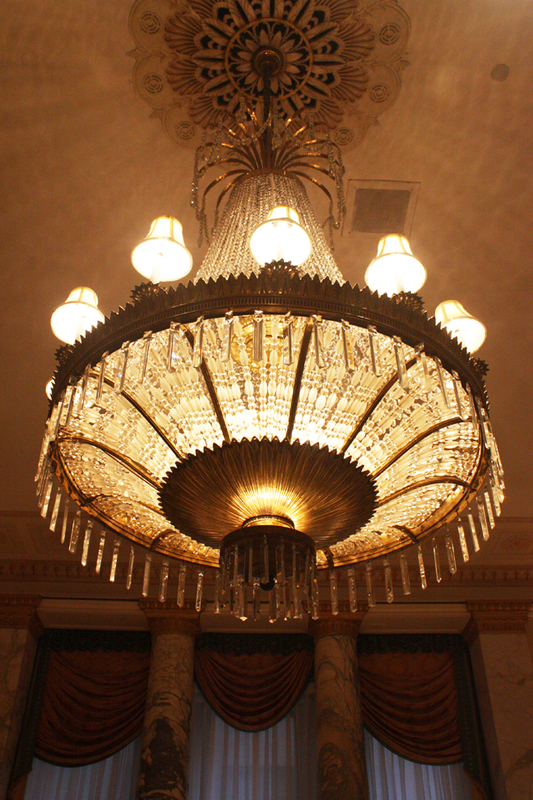 One of the staterooms features this glorious chandelier! The architects recreated the Hall of Mirrors at Versailles at the Waldorf. 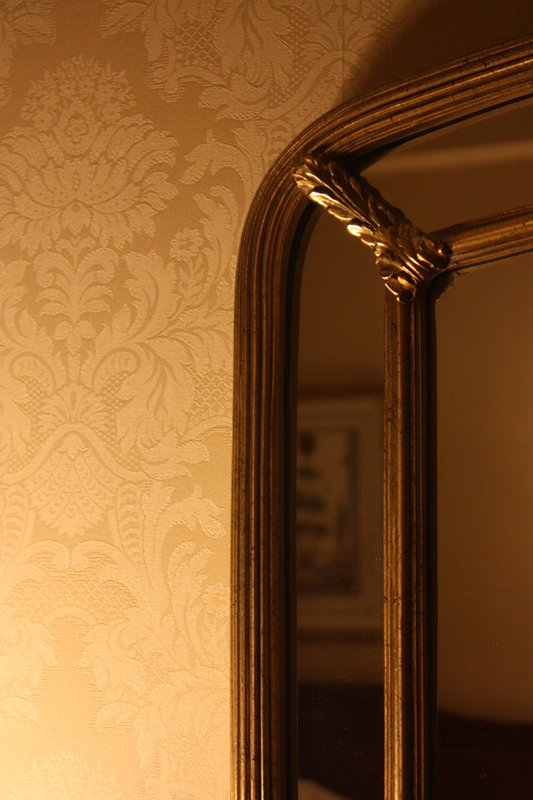 This corridor is called the Silver Corridor, lined with mirrors and silver-leaf trim. The chandeliers are miniature replicas of the chandeliers at Versailles. 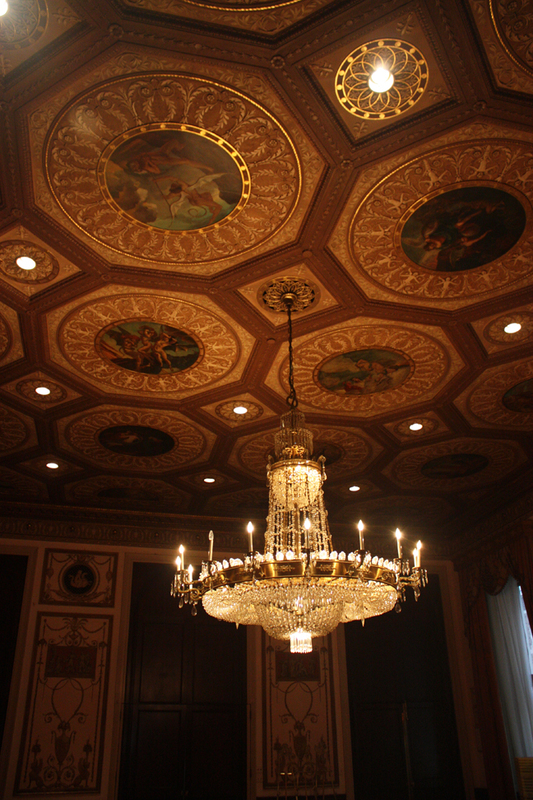 At the end of the Silver Corridor is this magnificent ballroom with hand-painted medallions on the ceilings. Details in our room: the W.A. 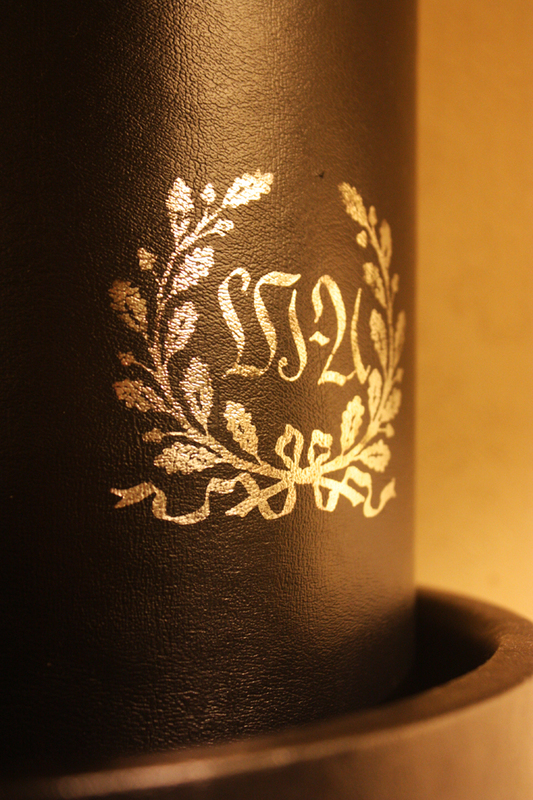 logo on our leather ice bucket, damask wallpaper and gold mirrors. 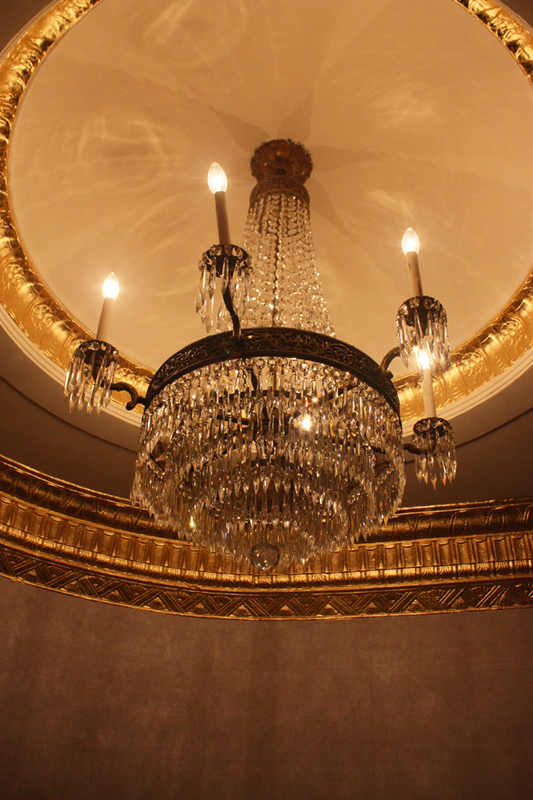 If you ever get the chance to stay at the Waldorf, you are in for some serious pampering! Even if you never stay there, I would suggest taking a guided tour of the hotel if you visit the city. 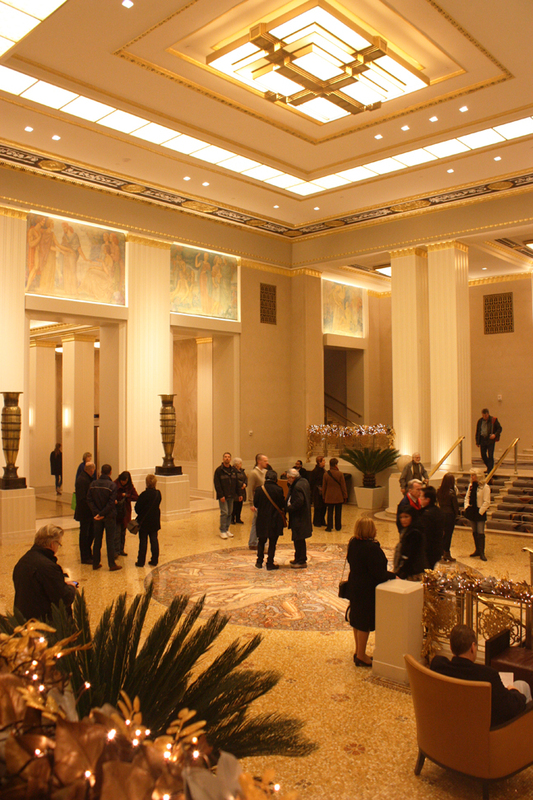 Anyone interested in Manhattan history, Art Deco architecture or interior design will adore the tour. 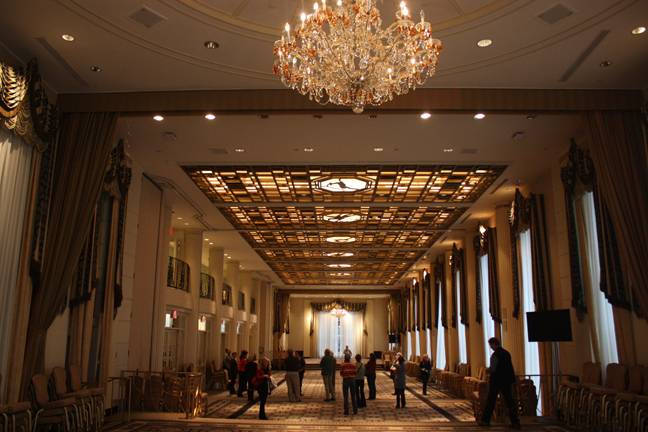 Tours begin at $10 and last for one hour, with access to all the ballrooms. 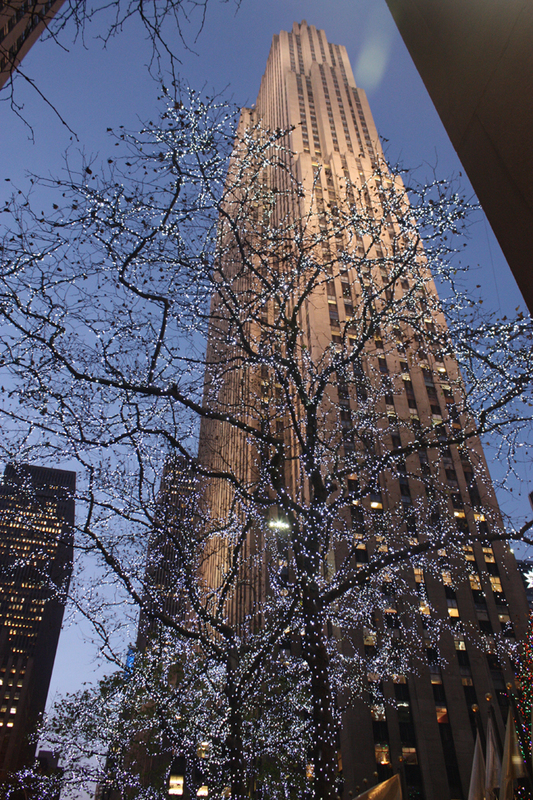 Just a block away from the hotel was the beautiful Rockefeller Center, all done up for the holidays. Wow!! Beautiful Hotel, the Architecture and interior is stunning. Love the chandeliers.